Battery There are 28 products. 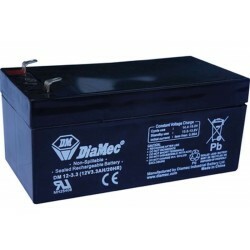 Diamec DM12-1,3 sealed lead acid (SLA) battery. 12V 1,3Ah. This is a sealed rechargeable battery box for medium-energy consuming appliances. It is suitable for street lights, security alarm systems and automatic wheelchairs. It is recyclable and environmental friendly. 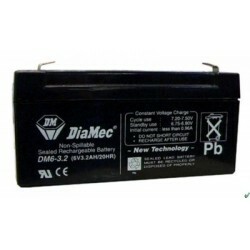 Diamec DM12-2,2 sealed lead acid (SLA) battery. 12V 2.2Ah. This is a sealed rechargeable battery box for medium-energy consuming appliances. It is suitable for street lights, security alarm systems and automatic wheelchairs. It is recyclable and environmental friendly. 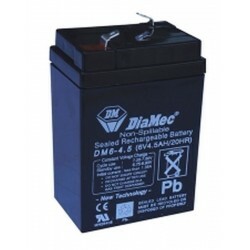 Diamec DM6-4.5 sealed lead acid (SLA) battery. 6V 4.5Ah. This is a sealed rechargeable battery box for medium-energy consuming appliances. It is suitable for street lights, security alarm systems and automatic wheelchairs. It is recyclable and environmental friendly. 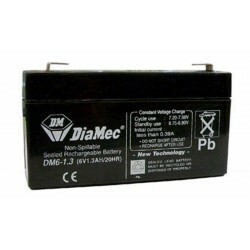 Diamec DM12-3,3 sealed lead acid (SLA) battery. 12V 3.3Ah. This is a sealed rechargeable battery box for medium-energy consuming appliances. It is suitable for street lights, security alarm systems and automatic wheelchairs. It is recyclable and environmental friendly. 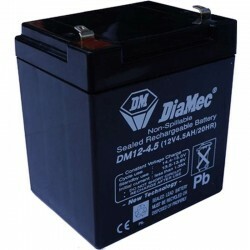 Diamec DM12-4,5 sealed lead acid (SLA) battery. 12V 4.5Ah. This is a sealed rechargeable battery box for medium-energy consuming appliances. It is suitable for street lights, security alarm systems and automatic wheelchairs. It is recyclable and environmental friendly. 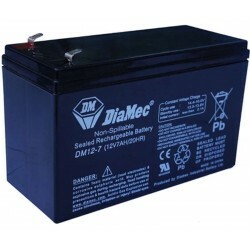 Diamec DM12-7 sealed lead acid (SLA) battery. 12V 7Ah. This is a sealed rechargeable battery box for medium-energy consuming appliances. It is suitable for street lights, security alarm systems and automatic wheelchairs. It is recyclable and environmental friendly. 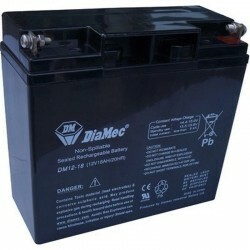 Diamec DM6-12 sealed lead acid (SLA) battery. 6V 12Ah. This is a sealed rechargeable battery box for medium-energy consuming appliances. It is suitable for street lights, security alarm systems and automatic wheelchairs. It is recyclable and environmental friendly. 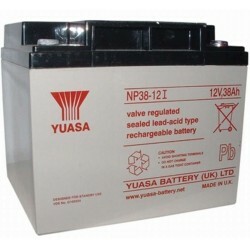 Yuasa NP2.3-12 sealed lead acid (SLA) battery. 12V 2.3Ah. This is a sealed rechargeable battery box for medium-energy consuming appliances. It is suitable for street lights, security alarm systems and automatic wheelchairs. It is recyclable and environmental friendly. 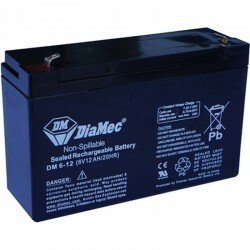 Diamec DM12-12 sealed lead acid (SLA) battery. 12V 12Ah. This is a sealed rechargeable battery box for medium-energy consuming appliances. It is suitable for street lights, security alarm systems and automatic wheelchairs. It is recyclable and environmental friendly. 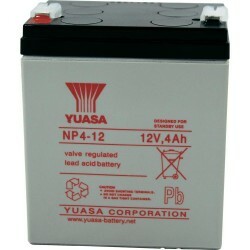 Yuasa NP4-12 sealed lead acid (SLA) battery. 12V 4Ah. This is a sealed rechargeable battery box for medium-energy consuming appliances. It is suitable for street lights, security alarm systems and automatic wheelchairs. It is recyclable and environmental friendly. 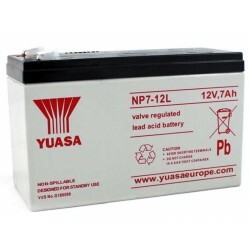 Yuasa NP7-12 sealed lead acid (SLA) battery. 12V 7Ah. This is a sealed rechargeable battery box for medium-energy consuming appliances. It is suitable for street lights, security alarm systems and automatic wheelchairs. It is recyclable and environmental friendly. 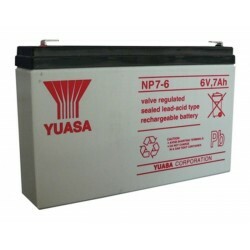 Yuasa NP7-6 sealed lead acid (SLA) battery. 6V 7Ah. This is a sealed rechargeable battery box for medium-energy consuming appliances. It is suitable for street lights, security alarm systems and automatic wheelchairs. It is recyclable and environmental friendly. 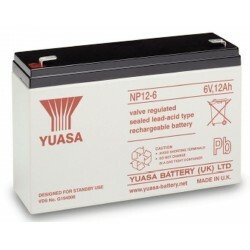 Yuasa NP12-6 sealed lead acid (SLA) battery. 6V 12Ah. This is a sealed rechargeable battery box for medium-energy consuming appliances. It is suitable for street lights, security alarm systems and automatic wheelchairs. It is recyclable and environmental friendly. 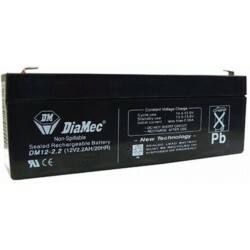 Diamec DM12-18 sealed lead acid (SLA) battery. 12V 18Ah. This is a sealed rechargeable battery box for medium-energy consuming appliances. It is suitable for street lights, security alarm systems and automatic wheelchairs. It is recyclable and environmental friendly. 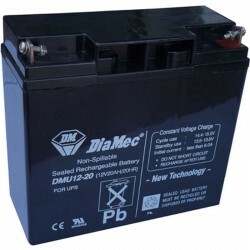 Diamec DM12-20 sealed lead acid (SLA) battery. 12V 20Ah. This is a sealed rechargeable battery box for medium-energy consuming appliances. It is suitable for street lights, security alarm systems and automatic wheelchairs. It is recyclable and environmental friendly. 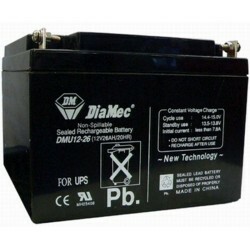 Diamec DM12-26 sealed lead acid (SLA) battery. 12V 26Ah. This is a sealed rechargeable battery box for medium-energy consuming appliances. It is suitable for street lights, security alarm systems and automatic wheelchairs. It is recyclable and environmental friendly. 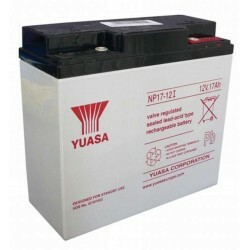 Yuasa NP17-12 sealed lead acid (SLA) battery. 12V 17Ah. This is a sealed rechargeable battery box for medium-energy consuming appliances. It is suitable for street lights, security alarm systems and automatic wheelchairs. It is recyclable and environmental friendly. 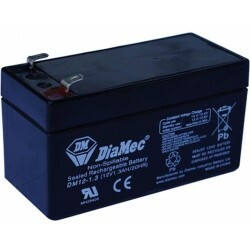 Diamec DM12-40 sealed lead acid (SLA) battery. 12V 40Ah. This is a sealed rechargeable battery box for medium-energy consuming appliances. It is suitable for street lights, security alarm systems and automatic wheelchairs. It is recyclable and environmental friendly. 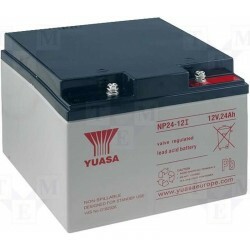 Yuasa NP24-12 sealed lead acid (SLA) battery. 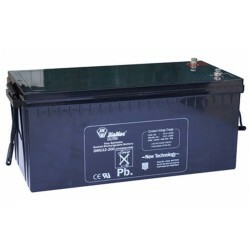 12V 24Ah. This is a sealed rechargeable battery box for medium-energy consuming appliances. It is suitable for street lights, security alarm systems and automatic wheelchairs. It is recyclable and environmental friendly. 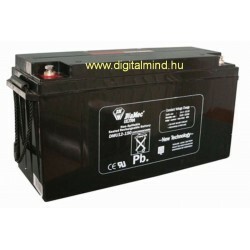 Diamec DM12-65 sealed lead acid (SLA) battery. 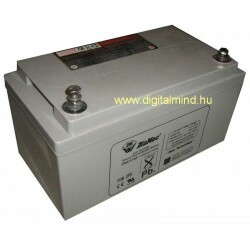 12V 65Ah. This is a sealed rechargeable battery box for medium-energy consuming appliances. It is suitable for street lights, security alarm systems and automatic wheelchairs. It is recyclable and environmental friendly. 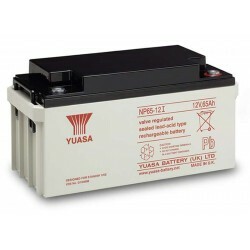 Yuasa NP38-12 sealed lead acid (SLA) battery. 12V 38Ah. This is a sealed rechargeable battery box for medium-energy consuming appliances. It is suitable for street lights, security alarm systems and automatic wheelchairs. It is recyclable and environmental friendly. 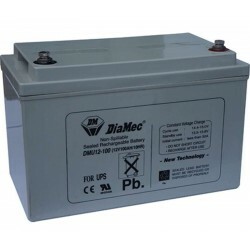 Diamec DM12-100 sealed lead acid (SLA) battery. 12V 100Ah. This is a sealed rechargeable battery box for medium-energy consuming appliances. It is suitable for street lights, security alarm systems and automatic wheelchairs. It is recyclable and environmental friendly. 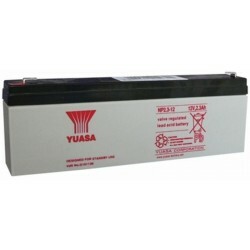 Yuasa NP65-12 sealed lead acid (SLA) battery. 12V 65Ah. This is a sealed rechargeable battery box for medium-energy consuming appliances. It is suitable for street lights, security alarm systems and automatic wheelchairs. It is recyclable and environmental friendly. 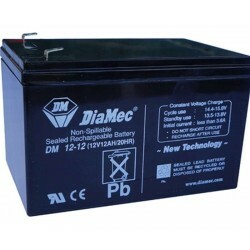 Diamec DM12-150 sealed lead acid (SLA) battery. 12V 150Ah. This is a sealed rechargeable battery box for medium-energy consuming appliances. It is suitable for street lights, security alarm systems and automatic wheelchairs. It is recyclable and environmental friendly. 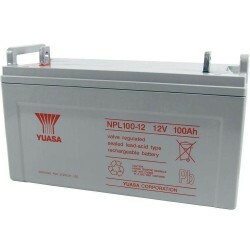 Yuasa NPL100-12 sealed lead acid (SLA) battery. 12V 100Ah. This is a sealed rechargeable battery box for medium-energy consuming appliances. It is suitable for street lights, security alarm systems and automatic wheelchairs. It is recyclable and environmental friendly. 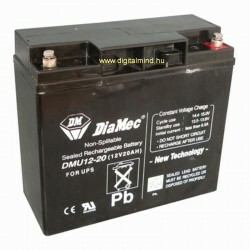 Diamec DM12-200 sealed lead acid (SLA) battery. 12V 200Ah. This is a sealed rechargeable battery box for medium-energy consuming appliances. It is suitable for street lights, security alarm systems and automatic wheelchairs. It is recyclable and environmental friendly.